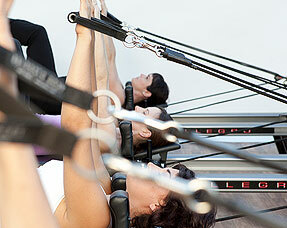 Enrich your Pilates experience in a fun and challenging group equipment class! Dedicated to creating a safe group class environment, Pilates Studio City provides dynamic full-body workouts in an intimate class setting of 3 to 6 clients. We require that each participant have experience and studio consent prior to joining level 1 or higher. This is to ensure familiarity with the language and basics of Pilates and the equipment set up of adjustable ropes, pulleys, springs, foot bar and the carriage system. Taught by amazing Pilates teachers that will help guide you to the classes that best match your skill level and desired goals! If you are new to Pilates, please call to schedule your Initial Private session today to get started!